Coach Anderson is proud to be back with Columbine once again. This is his 10th season coaching the Offensive Line. He has a great group of young men on the line and is very excited about the 2012 season. Coach Anderson is very happy to be a member of the Columbine Football coaching staff and is looking forward to another great year with the Rebels. Columbine Football has such a rich tradition and I am very proud to be a part of it! Coach Halsey is in his 7th year at Columbine High School coaching Linebackers. Prior to Columbine he spent 6 years coaching football at the Junior College and University levels. Coach Halsey is also in his 7th year as a teacher at Columbine, where he is teaching Business and Marketing classes. He is married to Tricia and they have two wonderful little boys, Noah (3 years old) and Micah (20 months old). Coach Holliday is a 1996 graduate of CHS, playing for Coach Lowry during his first years at Columbine in 1994 and 1995. He had the opportunity to play on at the University of Mary in Bismarck, North Dakota and graduate in 2001. In addition to coaching, he also teaches Physical Education at Columbine. This will be his 12th year at Columbine coaching the running backs. He is very excited to be back with his coaches and players and plans to have another successful season. Coach Thomas is a Columbine alumnus who is in his 11th year of coaching both the Offensive and Defensive lines. Coach Thomas believes the relationships forged by this football program and the people involved with it make strong and disciplined young men who are ready to face any future endeavor. The bonds between coaches and athletes go beyond what any simple game can teach young people. The young men involved in Rebel football discover a little more about themselves through the adversities, achievements, efforts, and commitments required to wear the blue and silver. Coach Davis graduated from Columbine in 1997. John is in his 6th year as an Offensive coordinator and Linebacker coach for the JV team. He is excited to see all of these young men continue to grow and develop on the field and in the classroom. Dave Evans enters his third season coaching football at CHS and 16th year overall. He has coached all levels from junior high to college. Coach Evans will be working with the JV and Freshmen teams this year. He is a graduate of Kansas State University. He also coaches track and field, where he has led numerous student athletes to state championships and top 5 finishes in the throwing events. He has a 10 year-old son, Kyler. Coach Kestner is 23 years old and is from Roanoke Virginia. He graduated from Virginia Tech in 2011. He has coached middle school football for two years. He and his wife are currently studying for their Masters degrees at Denver Seminary. He is planning on being a youth pastor after graduation. Coach John Lowry is excited to be back at Columbine coaching the quarterbacks and defensive backs. He played football at Ft. Lewis College and has spent many years coaching at both Little League and High School levels. He is looking forward to coaching along side his brother and the rest of the Columbine Coaches as they head into the 2012 season. Coach Smith graduated from Columbine in 2006. He was a part of the 2002 State Championship football team at CHS. This is his third year coaching for Columbine. He attended and played football for Montana State University-Northern and was a four year starter. Coach Smith will be coaching the JV Offensive/Defensive Line and is very excited about this year’s group of young men. Coach Smith is very optimistic that we will have a very successful year in 2012. Coach Uribe works as a CPM Tech at Total Orthopedics. He graduated from Columbine in 2009 and played football all four years. He coaches defensive backs and running backs. This will be his first year coaching football at the high school level. He has coached little league for a couple years and coached a level 3 baseball team at Columbine for one year. Mike is excited to coach at Columbine because he loved playing football for this program. He is also excited to learn from some of the best coaches in the state and is looking forward to another great year at Columbine. Coach Anderson has been coaching in South Jeffco for the last seven years. This is his first year coaching at Columbine. He will be coaching the offensive and defensive lines, he is very excited about carrying on the great tradition at Columbine. He currently runs the maintenance department at St. Joseph’s in Golden. Brady Haynes teaches Health and Physical Education at Columbine. He graduated from Fort Lewis College with a degree in Exercise Science, and minors in Philosophy and Art. Brady was a three-year starter at Fort Lewis College, playing linebacker. He is currently pursuing a Masters in Theology and works part-time as a commercial artist. Coach Lee has been coaching for 10 years in Jefferson County and 6 with Columbine. This will be his 4th year as Defensive Coordinator and Defensive Backs coach. He also coaches the Running backs on the offensive side of the ball. Coach Lee is a Physical Education teacher at Ken Caryl Middle School. Coach Schloegl has been coaching in Jeffco since 2004. This is his 4th year at Columbine. Coach Schloegl has been teaching social studies at Ken Caryl Middle School for 18 years. He coaches Linebackers and Receivers. Ron is a retired Jeffco employee who has been involved with the Columbine football program for many years. Along with being the statistician, he helps organize the Rebel Golf Tournament every year. He is also Columbine’s game manager for all indoor sporting events. Ron is married to Sue and they have two grown children. 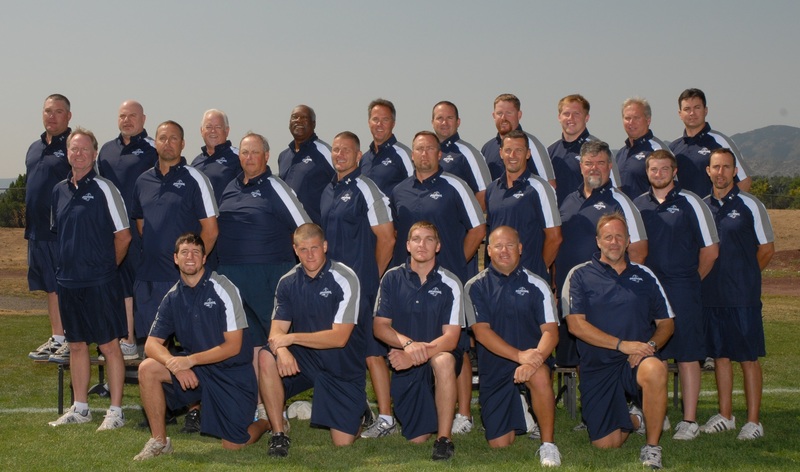 Matt is starting his 20th year as an Athletic Trainer and His 6th year at Columbine. He is the trainer for all levels of Rebel ball as well as for all other sports at CHS. Matt is married to Angela, a 1st grade teacher at Aspen Academy. They have 3 children, Jordyn, Jared and Jim.